So far, we’ve talked about pellets, grains, and “mash” diets, and why none of them are really very good for our feathered companions. In this post, we’re going to take a look at what Patricia Sund calls the “Chop” diet. Patricia is a fantastic blogger with lots to offer the avian community (she’s also the writer of BIRD TALK magazine’s “Memo to Parker and Pepper.”) Though I’ve never talked to Patricia, I must admit, it’s lovely to see someone who makes an educated effort to provide their birds with a healthy, whole-foods diet, and is so darned witty about it! Looking for information, I found “mash” diets. And they just didn’t seem right since, well, parrots can’t cook, and “mash” diets required a whole lotta’ cookin’ to create. After some searching, I found Pamela Clark’s Seven Layer Salad, which is essentially “chop” but put together in a much more formal fashion – by layering ingredients which are chopped or shredded by hand, and aren’t ever frozen. But it took me several hours each week to shop for, clean, chop, and layer the items “just so”….and I still ended up throwing a lot of it away, since it was stored in the fridge and got yucky in a few days. So I just did my own thing with my little food processor, my freezer, and little to no cooking. And I got fantastic results. Then one day, I stumbled on Patricia’s blog and found that she – and loads of other folks – had been feeding what she refers to as a “chop” diet! So what the heck is “chop”? Essentially, “chop” is made with whatever fresh foods you have available to you at the time that you make it. It’s limited only by your imagination (and your budget), so there’s no need for a recipe. It’s just crazy enough to be fantastically useful while at the same time driving some people mad. Like Particia, I find recipes to be limiting and cumbersome. If a recipe calls for an ingredient that is out of season or otherwise unavailable, some folks may choose to substitute one item for another. Others may choose to not make the recipe at all. But for many of us, if you say “use what you have, and make the best of it”, we’ll take that and run! Patricia does presentations on making “chop” and I’ll be the first to admit that they look like more fun than what I do in my kitchen once a month. That being said, making “chop” is cheap and easy, once you get the hang of it. To make “chop”, you’ll need a food processor of some nature. Or, at the very least, one will come in incredibly handy. I have this KitchenAid 3-cup processor – it works well, but it can be a pain when making large batches. It’s about time I made “chop” again, and if I’d had a little more forethought, I’d have planned this blog around making it so that I could have included pictures. Fortunately, Patricia has a lovely picture of a batch of her “chop”, which you can find here. 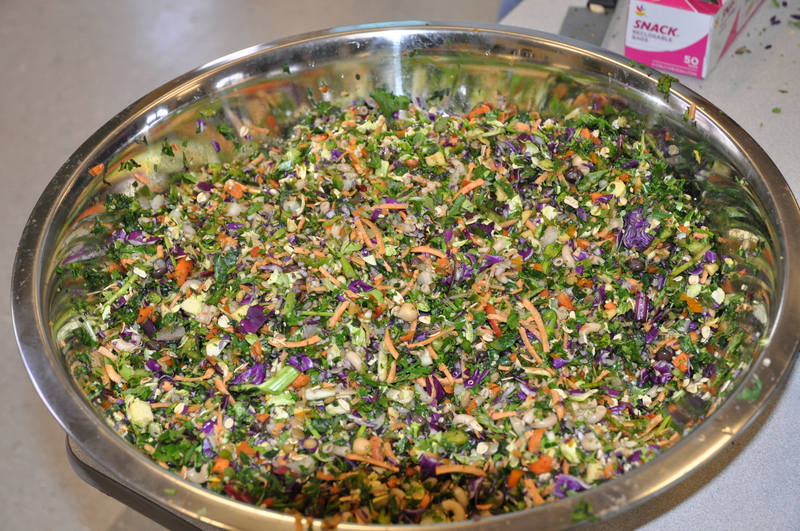 Along with the greens and veggies, I offer fresh sprouts every day, with several supplements (like ground flax seed, Fresh Addition, coconut oil, and palm oil) on alternate days. You’ll notice, however, that I don’t include fruits in my chop. Most folks don’t, simply because fresh fruits are very watery and make the thawed chop a little too mushy. But…I do dehydrate my own fruits, and I’ll add some of these to the mix to absorb some of the extra moisture, especially in the winter when fresh, organic fruits are pretty limited. Otherwise, fruits (along with some other fresh veggies) are skewered and hung in the cage for foraging opportunities. Some folks scoff at the idea of a diet that consists primarily of “wet” foods based on the reasoning that parrots “can’t” forage for these foods in their cage. And to that, I say…pfft! 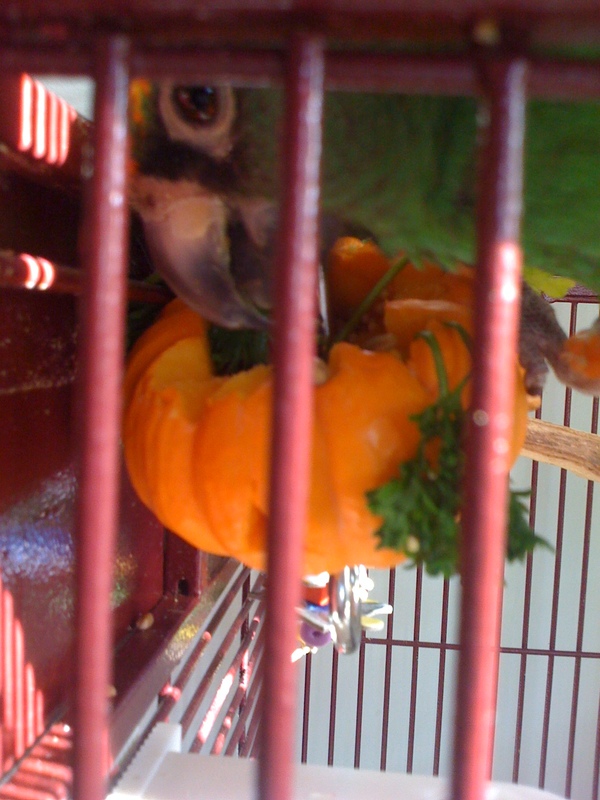 With a little creativity, our parrots can eat their delicious and nutritious “chop” from something (anything!) other than an open bowl. Fugi – a Lesser Jardine’s parrot – was my first bird, and she taught me a lot (not the least of which was the value of stainless steel skewers!) Hollowed fruits and veggies make great edible foraging vessels. I’ve used apples, cucumbers, zucchini, squashes, artichokes, just about anything that can be eaten raw, with no complaints from my parrots. The other upside is that I can shove things like pine nuts and shelled almonds into the flesh of many of these foods for added foraging. With all of these “wet food foraging” options, there’s no excuse for offering our birds the “good stuff” in a dish and making them work only for the dry stuff! “Chop” is a healthy, fresh, biologically appropriate diet that, with a little effort, can be foraged for. When done right, it provides a wide variety of nutrients, and plenty of enrichment. The ideal diet!